Pergola! Picnic Pavilion! Then – barbecue! 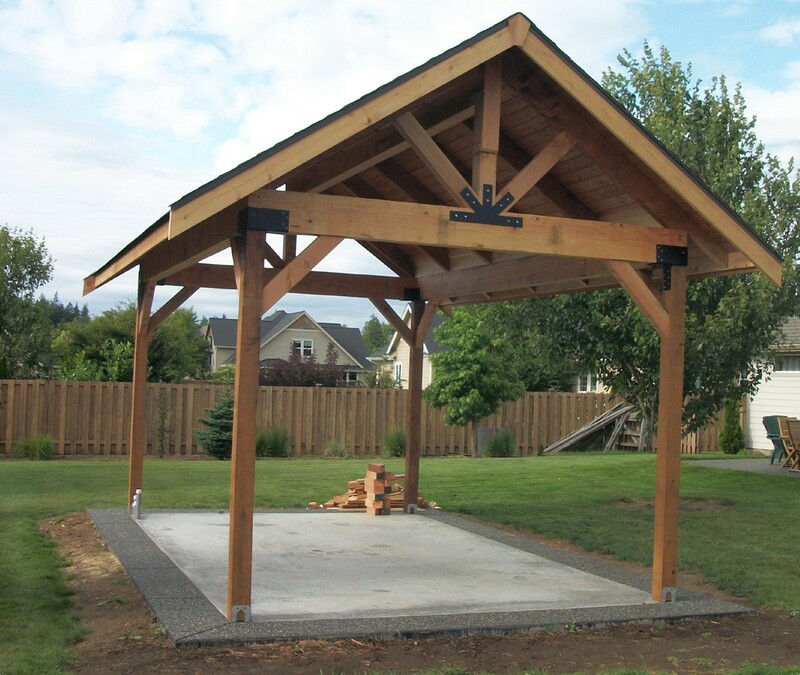 We recently constructed a 12 by 20 ft. pergola for a client who had previously installed a concrete pad with gas piping in ground for his gas grill. This was a fun little project. Pergola, ready for barbecue time! It involved applying for and receiving the permit and then building the pergola per the owner’s pre-engineered specifications; managing the roofing by a subcontractor and cleaning the area of all refuse. 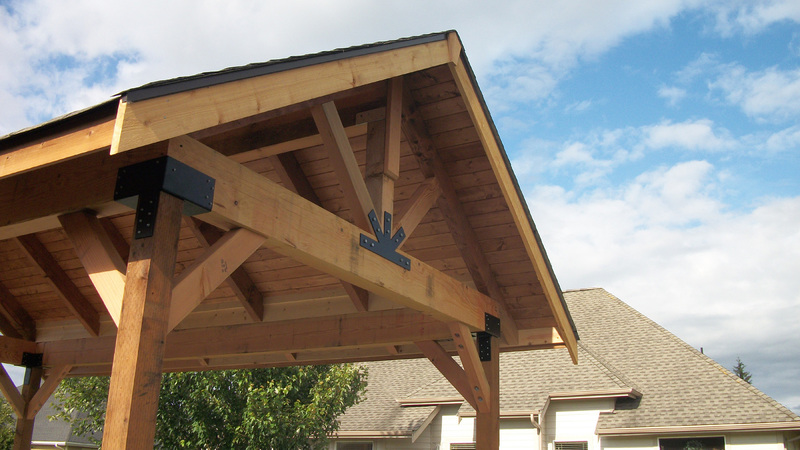 The pergola was constructed primarily of fir with HDG fasteners. The steel end plates are both decorative and structural elements. 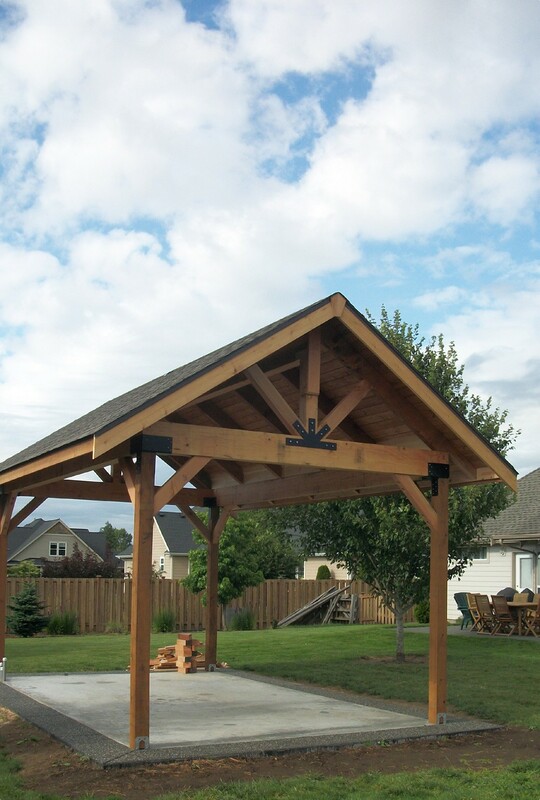 The pergola is now ready for summer barbecues, and rain is not a problem with this sturdy roof! By far one of the most popular search terms people use to find this blog is “outdoor kitchens.” Earlier today I posted our outdoor kitchen project and thought I’d continue by providing some information about outdoor kitchens. Hope this is what you’re looking for. Enjoy! Outdoor kitchens are becoming more and more popular. Last year’s article NAHB Sees Sunnier Future for Remodeling – Eventually speaks about the demand for outdoor kitchens. They’re more popular amongst “upscale homeowners” living in homes above 2,000 square feet. Many homeowners are going this route because an outdoor kitchen is often (though not always) less expensive than an interior kitchen remodel. In fact, the slideshow “5 Killer Outdoor Kitchens” from CNN Money features beautiful outdoor kitchens ranging from $2700 to $70,000. So, why would somebody consider an outdoor kitchen in an area like the Pacific Northwest? After all… it rains. True. However, a roof goes a long way and our year round mild weather (as compared to, say, Chicago’s) means that even in incremental weather a covered outdoor space can get a lot of use. If you find yourself outside often, you may want to consider this remodeling type. People who get more use out of an outdoor kitchen include those who bbq often, entertain large groups or enjoy cooking elaborate meals on the grill. Furthermore, you may want to consider an outdoor kitchen if you have a currently unused deck or patio that just doesn’t feel right. Adding a more comfortable spot to rest and a reason to be out there may be just what you need to reclaim the space. Additionally, if your home gets very hot in summer and you don’t have (or don’t want to use) an air conditioner, it can be extremely uncomfortable cooking inside. An outdoor kitchen may be right for you as well. The most important step when deciding to build an outdoor kitchen is to decide exactly what you need or want in the space. No two people’s needs will be the same, so make sure you’re being honest in your assessment of what you would actually use. Of course, if you’re not sure what you need, your contractor can point you in the right direction. After all that, are you interested in your own outdoor kitchen? Great! First, go read this wonderful article from This Old House that compares indoor and outdoor kitchens as well as discusses planning and location issues. Need to see more? Take a look at the slideshow Outdoor Kitchen Ideas (most in this slideshow are on the rustic side) or Outdoor Kitchen Design Ideas. The possibilities for an outdoor kitchen are truly endless. By far one of the most popular search terms people use to find this blog is “outdoor kitchens.” Though I’ve already shown the in-progress photos for one of our favorite projects, I thought our readers might be interested in learning about the specifics of the project. This project was one of our three REX award winners and the following was our written submission. Enjoy! While an exposed patio in Whatcom County is wonderful during dry summer days, its use is limited in any other weather. The homeowners wanted to cover their patio as well as add an outdoor kitchen and living space in order to spend more time outdoors. Working with the clients, Pat designed the outdoor living space with unique details while still complimenting the existing space. The largest challenges stemmed from the project’s exposed nature. A drain-down system was chosen in order to prevent freezing pipes during winter but the largest obstacle was unforeseen. A DelRay stainless steel outdoor ventless gas fireplace had been chosen as the seating area’s focal point. However, the city was concerned that the sitting area might not remain exposed, thereby present a danger. After assurances to the city, the project received its final approval to the homeowners’ delight. Our project manager DyLon, with over fifteen years of professional experience and a dedication to the NAHB Code of Ethics, led a team in creating the attractive and durable addition. They began by digging a new utility trench and removing the home’s existing roof overhang. The new flat roof sections were created by placing a grey Carlisle Sure-Weld thermoplastic membrane roofing system above an exposed tight-knot spruce structure. Matched laminate asphalt shingles top the center gable roof section. Other final touches include sheet metal scupper drains, new gutters, a 60 foot long retaining wall and two sets of stairs. Though patios are often more functional and less aesthetic, the homeowners and Rose Construction dreamed of a space that would incorporate both qualities. To bring natural light into the covered area, four Crystalite flat glass skylights and two 4×4 Crystalite pyramid shaped acrylic skylights were installed. Paddle fans, an ice maker, electric receptacles and power for outdoor appliances add convenience and comfort. The nineteen linear foot outdoor kitchen features a ten foot bar, a Blanco undermount sink, Moen faucet and outdoor appliances. Stamped and colored concrete was poured over the existing concrete slab to create the flooring. Additionally, the team laid a 16’ x 17’ pad with strip drain featuring outlets installed in the gravel bed on each side of the patio. A flat screen television and four electric infrared heaters suspended from the ceiling help result in a beautiful but functional outdoor space for the family to enjoy. And finally, the job was complete! Complete - The Outdoor Fireplace, Seating Area, Skylights and Paddle Fan. Ready to Relax! As stated before, this was one of our favorite projects. Hope you see why!